Plaastic well designed garden Sprayer. Ideally suited for spraing disinfectants, liquid, water and chemicals and feritilizer liquid and disinfectant. Very useful made in accordance to i=overseas buyer requirements and and is a handy variety popularly used by most of overseas buyers. In order to cater to the numerous necessities of the patrons, we have been able to provide a wide range of Iron Garden Spray. 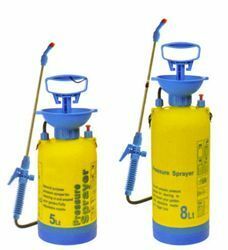 Swivel Atomizer Sprayer 900 ml. Our clients can avail from us a wide range of Rotary Atomizers, which is developed in tandem with the set industry norms. The required droplet size distribution is important to any successful spray dryer operation to ensure that all the powder specifications are met successfully. KisanKraft High Quality Garden Hand Pressure Sprayer with chemical resistance material thick body with extra one set of O rings. The Organic Garden Spray is prepared from pure organic soap nuts, which are best natural germicide, insecticide & pesticide and very effective if spraying on plants & garden. It is totally chemical free and gives protection organically to your garden & plants. Our company has created a niche in the field of offering Garden Water Sprayer. Garden Sprayer available in 1L and 1.5L in different 3 to 4 Colours with Brass Spray Nozzle. Good pressure and high quality.